When I first came to the United States, I was so glad to see the yellow noodles/oil noodles available in the Asian supermarket. Until I started using them for my Malaysian dishes~~~It lack the unique pungent taste that the noodles back home carries and it is also much less springy which in my opinion is a huge turn off in gon loh (dry) and stir fry dishes. I planned to make Harmee yesterday and figured that I have all the ingredients needed at home but yellow noodles. 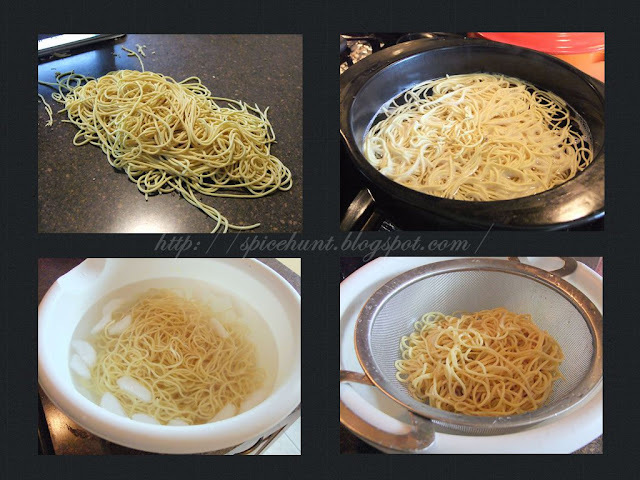 Since I have sometimes at hand before dinner, I decided to make this alkaline noodles at home. And man, am I glad! My Harmee turned out to be better than ever! 1. Mix together water, salt, food coloring and alkaline water until salt dissolves completely. Note：If you can't find alkaline water in the supermarket, you can make it at home by baking 1/4 cup of baking soda in toaster oven at 250F/120C for an hour, let it cooled to room temperature and use 1/4 tsp mixing with 1 tsp of water in this recipe, the remaining baked soda can be stored in air tight container for future use. 2. Slowly adding the flour into the liquid mixture to form a very stiff dough, the dough may not hold together very well and looks a little crumbly or pebbly, which is absolutely OK, just cover with a clean muslin cloth or kitchen towel and let it rest at room temperature for 10 minutes. Turn the dough out onto a working space and knead the dough again to form a small stiff ball, this may take up to 2-3 minutes. 3. 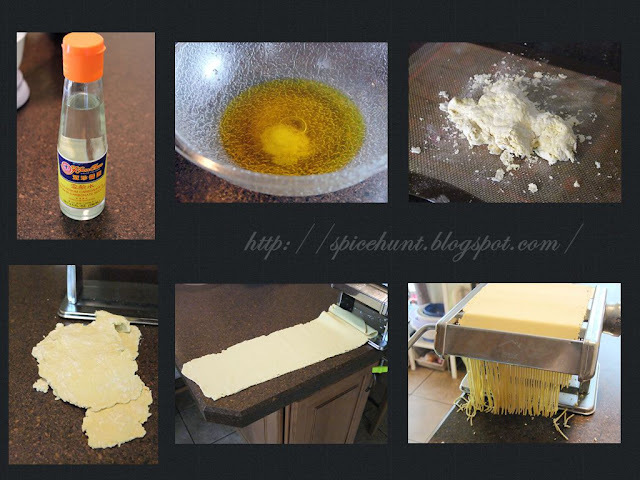 Divide the dough into 3-4 portions and roll each one out using a pasta machine, then combined two portion and roll again to form a larger piece, sprinkle some extra flour in between to prevent sticking together. Continue working until you get a one large sheet. Slowly work through the thickness setting one by one and roll the sheet as many time as you wish until you get a smooth looking one. Note：The noodles at this stage is called alkaline noodle (Ramen noodles). If you do not plan to use it immediately, add 1-2 tsp of flour on it to keep the noodles well floured, store the noodles in a box or zipped lock bag and refrigerate it for as long as 1-2 weeks. 5. To make yellow/oil noodle, bring a pot of water to boil and prepare a ice bath aside. 6. Cook the noodle in boiling water for 45 seconds if you intended to use the noodle in noodle soup, 60 seconds if it is intended for stir fry or Gon Loh. 7. 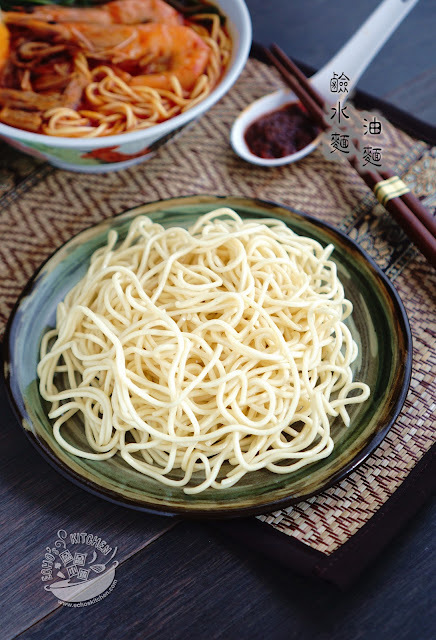 Take the noodle out and quickly dip it into ice bath for 30 seconds, drain and coat the noodles with some cooking oil, the oil noodle is now ready and could also be stored in the refrigerator for up to 3-5 days.